2. When tooth decay symptoms are present because of a trauma or fracture of the root, oral surgery procedures may be required to save a tooth from extraction. 3. Although primary teeth generally fall out naturally to make room for the permanent teeth, there are times the primary teeth are stubborn to expel naturally. Oral surgery procedures may be needed to make way for the permanent teeth to come in. 4. If there are teeth which interfere with proper orthodontics treatment, oral surgery procedures would be needed to extract the obstructing teeth. 5. Orthognathic surgery, or jaw surgery, is performed by an oral and maxillofacial surgeon for issues such as trauma to the jaw, inadequate position of the jaw, TMJ or temporomandibular joint pain, or teeth leading to extensive tooth wear. 6. Another oral surgery performed by a dentist or oral surgeon is for dental implants. These implants are commonly provided to gain stability for dentures, whether already existing or new. 7. When oral cancer is suspected, oral surgery is performed to obtain a biopsy to conclude suspicions of the disease. 8. Oral surgeons coordinate with healthcare specialists for proper procedures of cleft lip and cleft palate repair. 9. 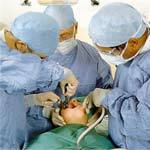 If a facial infection requires surgical attention, an oral surgeon would cut and drain an infected part of the mouth as well as remove teeth involved in the infection. 10. Oral surgery procedures for sleep apnea or snoring include the removal of soft tissues in the rear of the mouth, or oropharynx, and the lower jaw. Laser surgery is sometimes performed for this problem.